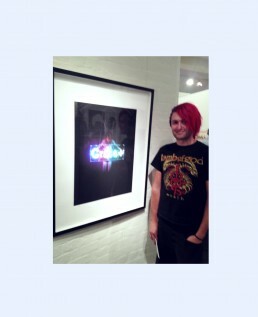 This work is themed around the greater research I undertook during my MFA, that is, investigating connections between our online (ethereal) and offline (corporeal) selves. Social media, and the increasing significance it has in our everyday lives, is of particular interest to me. 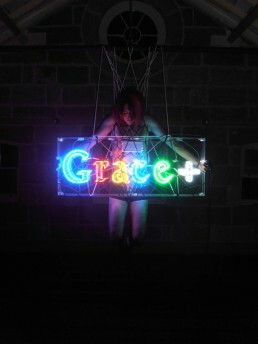 The neon sign in the nominated work ‘Grace+’ is a parody of Google’s social networking site, Google+. In this work I was seeking to investigate how social networking might be a new site of worship, in which we pay ‘respects’ to every day, in addition to becoming the institution holding our social groups together, the role the church/temple/mosque has held for thousands of years. However social networking is based around the worship of what is essentially refracted images of self, not an omnipresent ‘other’. The direction of worship has turned from ‘upwards’ to ‘inwards’, possibly as a reaction to an increasingly globalised culture. In this way, social networking is the most significant social trend in our recent history.